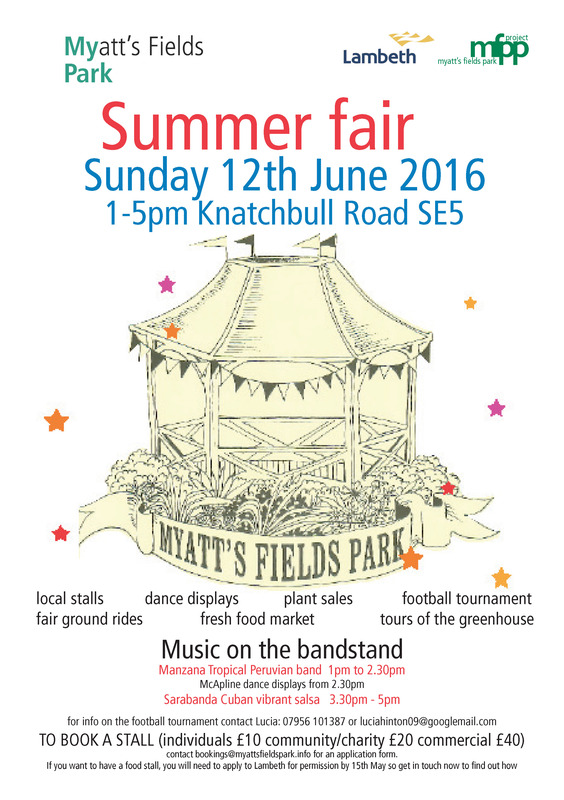 We are writing to invite you to take a stall in this year’s Myatt’s Fields Park summer fair on Sunday 12th June 2016 from 1-5pm. Our event will coincide with a giant street party held on the Mall to mark the Queen’s 90th birthday and will give people the chance to hold their own local celebration with a grand People’s Picnic. To bring the day to life we would very much like to have a good range of local food and craft stalls so do get involved! To book a stall, please contact Crina on bookings@myattsfieldspark.info who will send you an application form and payment details. Stalls will be allocated on a first come, first served basis and be hosted in the picnic area on the day. Or click <here> If you want to sell food you will need to submit an outdoor caterer's questionnaire by 15th May. (Please click <here> to download it). We would also very much appreciate help from volunteers on the day so please do get in touch if you would like to get involved. If you have any questions about the event, please contact Sara Harrison, Myatt’s Fields Park manager at manager@myattsfieldspark.info. Please note, Sara works Mon / Weds and Fri.